Mallorca Swim – swimming lessons for children, babies and adults at your home in Mallorca. Baby swimming lessons with Mallorca Swim offer a unique and precious bonding experience for you and your baby. Gentle and holistic, our classes give your baby the best possible introduction to water. Techniques such as buoyancy supports, front and back rides, active floating and relaxed holds all help to develop confidence and enjoyment. 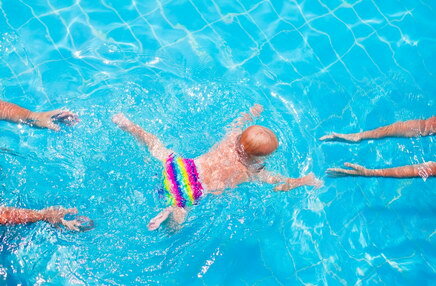 Fun is the name of the game when it comes to children’s swimming lessons with Mallorca Swim! We teach water safety from the start and swim skills are developed through play. From beginners through to competitive swimmers, our classes encourage kids to enjoy the water whilst keeping them safe in and around it. Adult swimming lessons in Mallorca will transform your experience and enjoyment of the water. If you are learning to swim, we will support you in the water so your confidence builds quickly and you feel in control. For those wishing to improve their technique, let us know what you need, and we’ll work with you to get you there. Mallorca Swim aqua fit sessions are the perfect exercise regime during the hot summer months. Tailored to individual needs and fitness goals, water-based work-outs benefit the whole body – strengthening muscles and your core whilst improving your cardiovascular fitness. An excellent way to diversify training and ideal for those with restricted mobility or recovering from injury. Aqua Yoga with Mallorca Swim adapts classic yoga postures to an aquatic environment. These classes combine water fitness, wellbeing and relaxation whilst focus is maintained on the breath. Aqua Yoga benefits everyone but is particularly beneficial for pre and post natal women, as well as people with joint problems or high blood pressure. 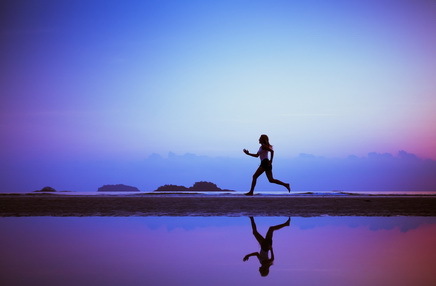 Our personal training sessions in Mallorca are invigorating and designed to inspire you to do even more! Adapted to a wide variety of client needs and goals, personal training with Mallorca Swim can include HIIT, running, strength training and TRX suspension training. We also offer personalised nutrition plans for vibrant health and weight loss management. Mallorca Swim is a sister company of Ibiza Swim and Cabo Swim. Ibiza Swim was established in 2007 when founder, Ruth Osborn, moved from the UK to Ibiza following a dream to create work out of her passion for swimming and love of the water. Over the years her business has grown organically, mostly through word of mouth recommendations. Since 2013 she has built on her sterling reputation and grown a team of equally highly professional and exceptional swim teachers and personal trainers. In 2017 she set up Cabo Swim (Baja California Sur, Mexico) and in 2018 Mallorca Swim had it’s first successful summer season. 2019 sees Ruth using those eleven years experience of creating, developing and running Ibiza Swim to extend to Cannes, Mykonos, Menorca, Monaco, Saint-Tropez, Tulum and Tenerife. Her ethos and commitment to providing exceptional teaching, running a highly motivated and happy team, and providing and the highest of professional standards remain the same.